1) Parmesan Truffle Fries. Otherwise known as my personal crack. These fries are hand-cut from select Kennebec potatoes and are served with a creamy aioli dipping sauce that is amazingly awesome. It's literally all I can do to keep from licking the paper to get every fleck of those truffle drenched Parmesan clumps off the paper once the fries are gone. So. Damn. Good. 2) Craft Cocktails. I am a fan of any family-friendly venue with a full bar. 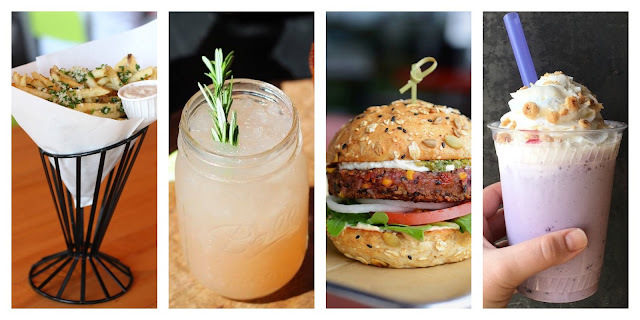 Mama always needs a cocktail after a hard day's work and Hopdoddy offers lots of traditional favorites like Margaritas and Bloody Mary's to seasonal creations. My current favorite is the Bubbly Blonde made with house-infused St. Germain, lemon, orange, bubbles. 3) The Burgers. According to Hopdoddy's website, their "beef comes from humanely raised cows, never, ever given growth hormones or antibiotics. We grind everything in-house daily." Their burgers range from Angus or Akaushi beef to Bison, Chicken, Turkey, and even Tuna. My favorite burger isn't even really a burger... it's more of a sandwich. The La Bandita burger is made from a black bean-corn patty, avocado, goat cheese, arugula, cilantro pesto, chipotle mayo, white onion, beefsteak tomato on a whole wheat bun. Now, you should know me well enough to know that I am all about taste. I don't care if it's marinated in the Fountain of Youth. If it doesn't taste good, I won't eat it and this veggie burger is the BOMB. 4) The Shakes. Every great meal should end with dessert and the milkshakes at Hopdoddy are amazing. Is it because they churn their own ice-cream? I dunno. But they sure are delicious. Choose from vanilla bean, Oreo cookie, caramel & sea salt, red velvet cake, stout chocolate or (my personal favorite) Nutella & chocolate pretzel. It's a perfect combination of salty and sweet. 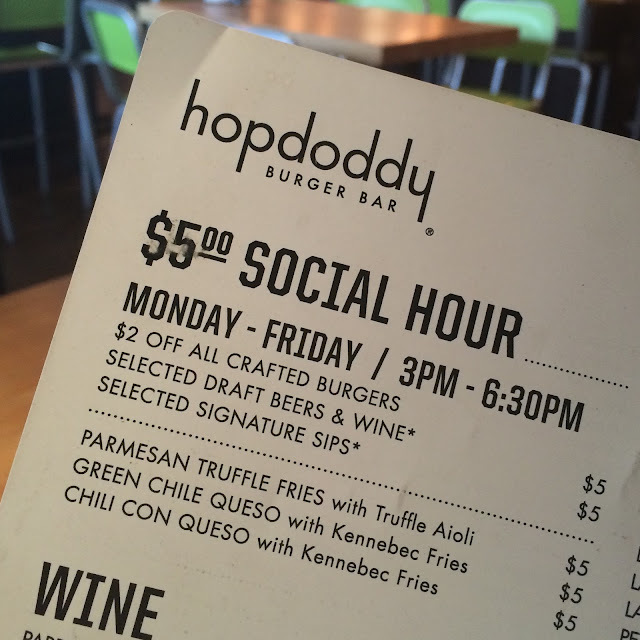 Hopdoddy has a killer Social Hour every Monday to Friday. From 3:00-6:30PM you can enjoy $2 off ll crafted burgers, select draft beers, wine and signature sips are $5 and queso and my beloved Parmesan Truffle Fries are $5! You can enjoy these offerings at a table or at the bar complete with TVs tuned in to the current sports event of the day. You can find Hopdoddy in Uptown, Park Cities and Addison. Visit their website for complete details. Enjoy.